The rest of his species was declared extinct in the UK. His location is a closely guarded secret. He is the last of his kind. 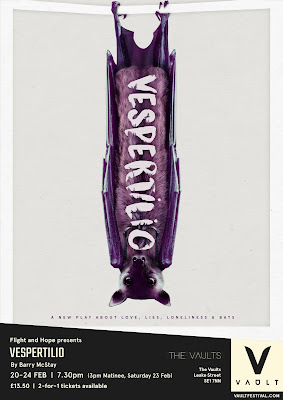 VESPERTILIO is a new play about love, loneliness, lies and bats. The story of one man's obsession and the charming young runaway he meets in the dark. Inspired by an article published by Patrick Barkham, VESPERTILIO is a 2-hander about a lone greater mouse-eared bat that has been returning to a railway tunnel near Chichester every winter since 2002 to hibernate. This play, set largely in that railway tunnel, is the story of one man’s obsession with protecting the creature and what happens when he risks opening himself up to a charming young runaway who he meets in the dark. With a performance spot secured as part of the VAULT 2019 festival and support from the Bat Conservation Trust, is it our hope that this production will combine issues with conservation and human loneliness to spark conversation and action. We’ve been so touched by the support and engagement we’ve received from the conservation community online and we’d love to have as many members of the BCT and the community to come and see our little bat play as possible. As such we’ve created the discount code ‘EARLYBAT’ which will grant £10 tickets when purchasing through the VAULT website https://vaultfestival.com/whats-on/vespertilio/. This offer will run until the 5th February, after which the tickets will be £13.50 for the preview date on 20th and £15.50 21st-24th. We’re so excited to announce that we’ll be hosting a Q&A with members of the BCT and the conservation community on Sunday 24th February at 3pm at the Liana Lounge of VAULT Festival, Leake Street, Waterloo. This will be an opportunity to find out more about the amazing creature that inspired VESPERTILIO and the plights of bats in the UK.